Background: Studies have shown that carotid intima-media thickness (CIMT) and ankle–brachial pressure index (ABI) can be used as surrogate markers of coronary artery disease (CAD). 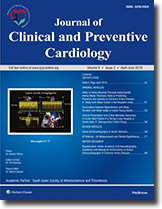 However, whether studying the ratio of ABI and CIMT has any added value in predicting CAD when compared to either of them alone, has not been studied. Aims: The aim of the study is to compare CIMT and ABI as surrogate markers for the presence and extent of CAD and to investigate whether studying the ratio of ABI and CIMT has any incremental value in predicting CAD than either of them. Methods: We prospectively enrolled 235 stable, non-ACS patients who underwent CIMT and ABI measurements followed by diagnostic coronary angiography. Results: The mean age of the study population was 56.32 ± 10.14 years. CIMT was significantly higher in the CAD group compared to non-CAD group (0.91 ± 0.22 vs. 0.66 ± 0.15, P ≤ 0.0001). ABI was significantly lower in the CAD group compared to non-CAD group (1.07 ± 0.19 vs. 1.18 ± 0.14, P ≤ 0.0001). At an optimal cutoff value of ≥0.75 mm, CIMT showed better predictive values (sensitivity and specificity –72.3% and 79%, respectively) compared to ABI ≤0.9 (sensitivity and specificity – 21.53% and 96.19%, respectively). CIMT was the strongest independent predictor of CAD (P < 0.0001) followed by ABI (P = 0.006) by multiple regression. 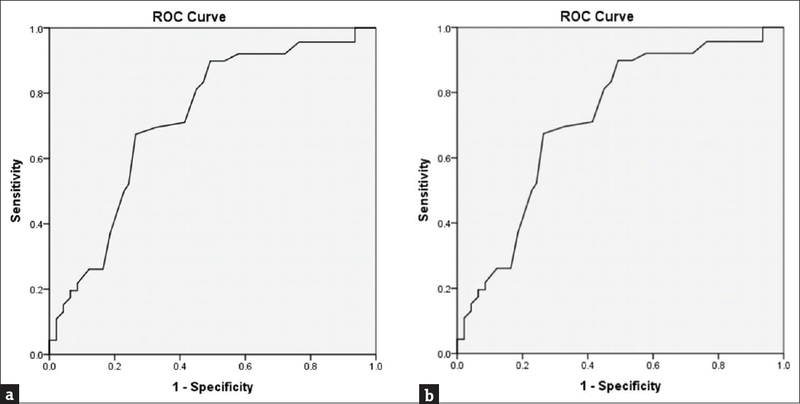 ABI/CIMT ratio of ≤1.55 had better predictive value (sensitivity and specificity –75.4% and 78.1%, respectively) and stronger correlation with CAD severity (R = 0.42), than either of them. Conclusion: CIMT is a better surrogate marker of CAD compared to ABI. Studying ABI/CIMT ratio has an incremental value in predicting CAD. Context: The prevalence of hypertension is on the rise in developing countries like India. Physiological parameters such as sleep duration and water intake may be associated with hypertension in young adults. Aims: The aim is to study the association between hypertension and day and nighttime sleep duration and water intake among young adults. Setting and Design: The study was a cross-sectional study, conducted among 596 students of Government Medical College, Kannauj, aged between 17 and 22 years. Materials and Methods: Participants were classified using the diagnostic criteria of the American Heart Association. Data were recorded on a pre-designed and pretested questionnaire. Data analysis was performed using SPSS 22.0. Receiver operator characteristic curve analysis and multiple logistic regression analysis were applied. Results: The prevalence of hypertension was 34.9%, 35.9% among boys, and 33.5% among girls, respectively. Less water intake and shorter sleep duration at nighttime were found to be independent predictors of hypertension. Cutoff of sleep duration at nighttime for predicting hypertension was ≤7.6 h among boys and ≤7.1 h among girls. The sensitivity and specificity of the cutoff for sleep duration at night time in boys was 79.3% and 74.2%, respectively, and that in girls was 81.5% and 75.6%, respectively. The cutoff for water intake for predicting hypertension was ≤2.1 L for boys and ≤1.5 L for girls, respectively. The sensitivity and specificity of the cutoff for water intake in boys was 74.8% and 70.3%, and in girls was 78.3% and 71.5%, respectively. Conclusions: Young adults with longer duration of sleep during night time and more water intake had a lesser risk of hypertension. Background: Heart failure (HF) is one of the leading causes of mortality and morbidity worldwide. We sought to describe the clinical epidemiology of HF from a representative sample in a tertiary care setting and to evaluate the factors which could increase the mortality risk in the study patients. Methods: This retrospective cohort study was carried out among patients who had been admitted with a diagnosis of acute HF from 2013 to 2017. Demographic data, history, laboratory investigations, data on medication clinical variables, and in-hospital outcomes were obtained from the patient's hospital records. The patients were assessed through the telephonic interview for mortality outcomes. Data were analyzed using SPSS software version 16.0 (SPSS Inc., Chicago, IL) and all values of P < 0.05 was considered as statistically significant. Results: A total of 355 acute heart failure (AHF) patients were included in the study with a mean age of 57.78 ± 12.78 years. 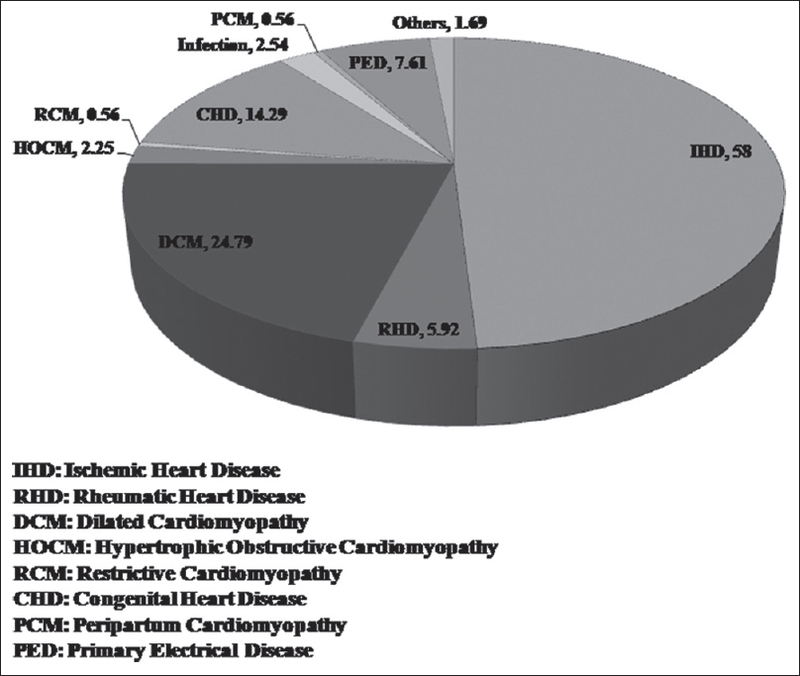 The most common etiologies among the study patients were ischemic heart disease (58%) and Dilated Cardiomyopathy (24.79%). The in-hospital and 2-year mortality was found to be 104 (29.3%) and 179 (50.4%), respectively. The 2-year mortality was significantly higher in patients with ischemic HF than that of nonischemic HF (119 [57.8%] vs. 58 [39.5%], P = 0.003). Multivariate Cox proportional hazard analysis demonstrated that elderly age, the presence of diastolic dysfunction and higher levels of total leukocyte count (TLC) were independent predictors of mortality. Conclusion: The mortality rate in AHF is higher among ischemic HF than nonischemic HF. The major factors contributing to the 2-year mortality rate among AHF were elderly age, diastolic dysfunction, and high-TLC. In apparently asymptomatic severe aortic stenosis (AS) group, stress echocardiography objectively identifies symptomatic, high-risk AS patients requiring early aortic valve replacement (AVR). The low-flow, low-gradient AS is well-characterized clinical entity with distinct diagnostic, management, and clinical outcome challenges. 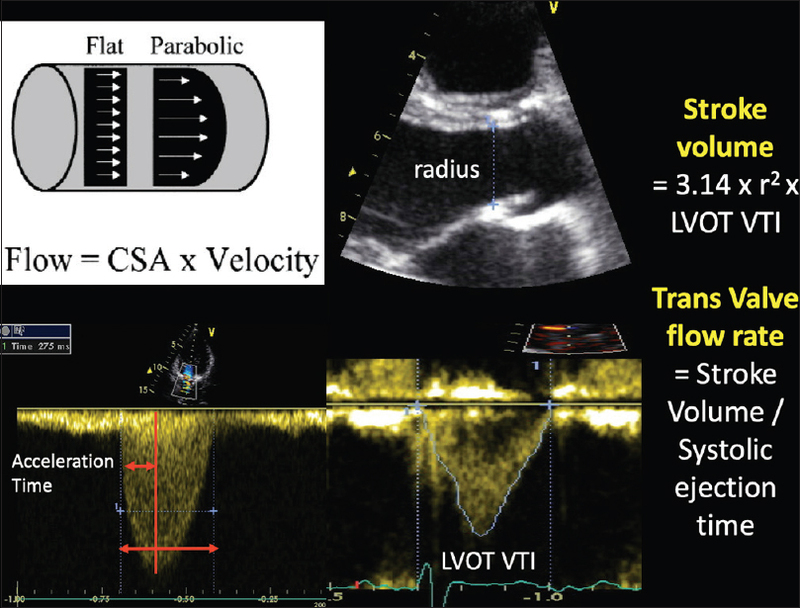 A comprehensive two-dimensional transthoracic echocardiography (2D echo) and Doppler and low-dose dobutamine stress echocardiography are of paramount importance for accurate diagnosis and timely decision of AVR. However, clinicians and imaging experts should be aware of the pitfalls and inaccuracies inherent in 2D echo/Doppler measurements and the effects of pathophysiological factors which impact the stroke volume and transvalvular gradient measurements. 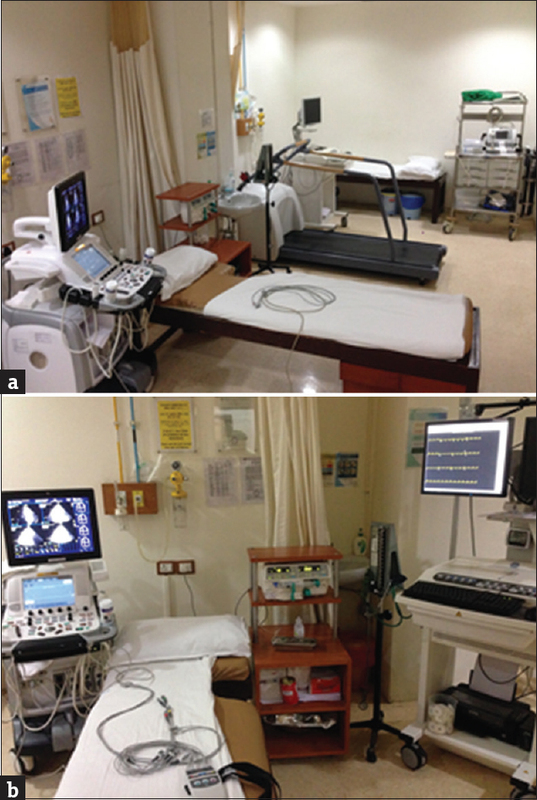 In appropriate clinical situations, clinicians should take additional help of cardiac computational tomography, cardiac magnetic resonance imaging, and biomarkers.